This is not a pass road however we had to include it in our list of roads ridden because it is so iconic. Most bikers think of the B500 as the road between Baden Baden and Freudenstadt. However, the B500 runs from the border with France where the D4 becomes the B500 as it crosses the centre line of the River Rhine, all the way to the border with Switzerland at Waldshut. Some times it is subsumed under other road designations but what you can say with confidence is that all sections where the road bears the designation “B500” are top biking roads. From the north at Baden Baden the first section runs for 30 miles to the T-junction with the B28 which runs east west from Freudenstadt to Oberkirch. The section of the B28 which runs down into Freudenstadt is good but if you want to ride all the sections of the B500 you need to turn right after about 1 kilometre of the B28 and take the L96 to Wolfach. At Wolfach turn right onto the B294 and then left onto the B33 to Triberg. The L96 and B33 are fine roads but the surface on the former isn’t very good and the latter can be quite busy. At Triberg the road once more becomes the B500. 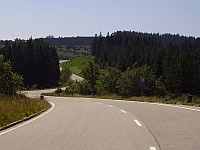 It’s not very exciting for the first 5 miles but after you’ve passed through Furtwangen a mile further on you turn left to get on the second great section of this road, towards Titisee. The next 12 or so miles are just as good as the first section. On the run down to Titisee the B500 is again subsumed, this time by the B31, a busy road that leads to Freiburg. After about 3 miles you turn right onto the B317 and after a further 3 miles you turn left to rejoin the B500 once more. The next 30 miles represents the third and final section of the B500 but you will not be disappointed. If you get the time to ride this fantastic stretch of road then do so. Note that motorcycles are banned from certain sections of the road at weekends so check in advance.